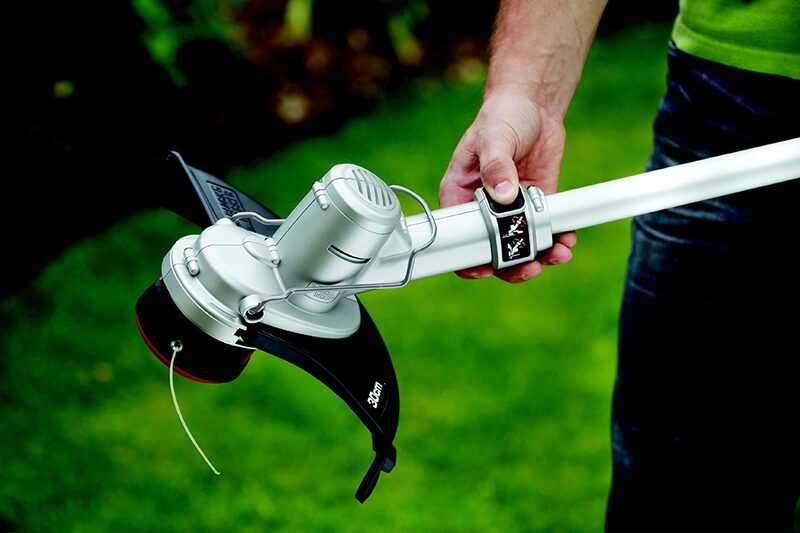 In this article we review the best cordless strimmers in the UK market. These are now the most trending choice for many gardeners in the UK. For quite a long time, the primary concern with the cordless variety, was the weakness of the battery. Buyers believed that a small rechargeable battery would not be strong enough to drive a motor that would spin, and then be able to cut grass and weeds. In those early days when these cordless strimmers launched, their suspicions were certainly justified. However, that concern has mostly been overcome. The batteries provided with many of these trimmers, are now very powerful, and last for a good 35-45 minutes before needing a charge. That is mainly down to the introduction of the much improved Lithium-Ion batteries. These are the same type of batteries that are now used in many of the power tools. Below we have created a list of the highest rated cordless trimmers that are currently available in the UK market. This model is our number one choice on the UK market at this moment in time. As such we highly recommend it to any gardener. It is a best selling product and gets consistent and fantastic ratings. A very powerful 36 Volt battery. Most others are 18 V.
Uses an automatic line feed system that works well, the battery lasts for a very long time, up to 45 minutes. This model is our number two choice on the UK market at this moment in time. This trimmer uses an automatic feed line, that is powered by an 18 volt Lithium-Ion battery pack. It is a very highly rated product by buyers, and they love the fact this it is portable, and can be taken to the allotment or to the graveyard when required. Works great on long grass and for doing edges. 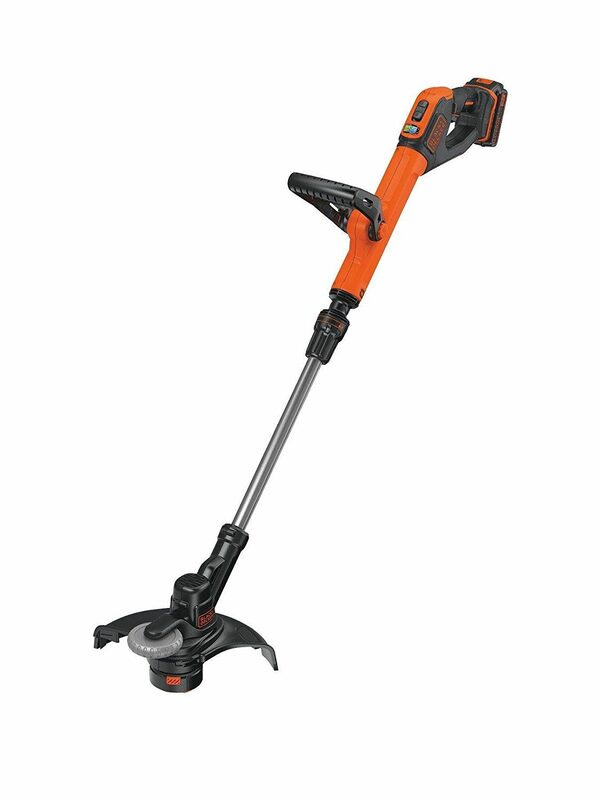 The telescopic shaft makes it easy to adjust the trimmer to your height. Has a cutting width of 28 cm and powered by a 500 watt motor. Also has a full 2-YEAR warranty! This model is our number three choice on the UK market at this moment in time. This trimmer uses an automatic feed line, that is powered by an 18 volt Lithium-Ion battery pack. 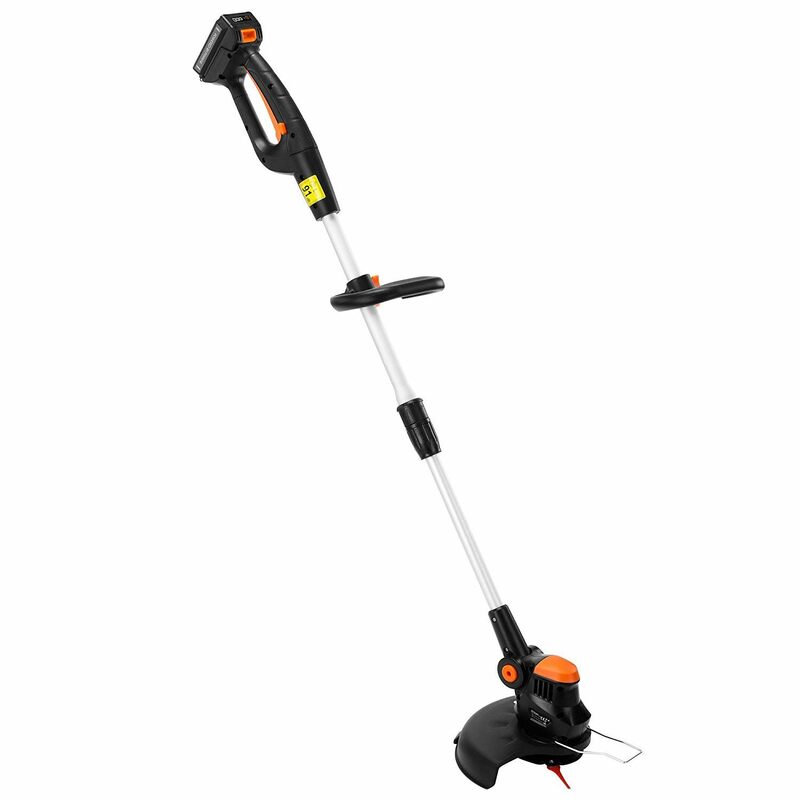 This has a 28 cm cutting which makes this one fast and also ideal for large areas. It has an automatic single line feed system. Any of those that are on our list above are very good choices based on all the researching that we have done. We have done a full buyer's guide for trimmers which you can read by clicking here. However, if you have decided that a corded one is best for you, here are a few tips to help you make the right decision. 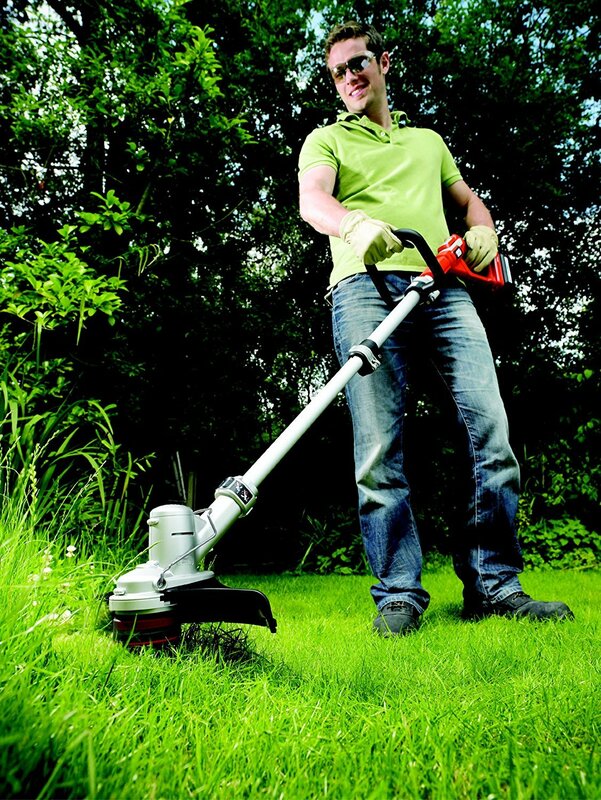 Cordless strimmers have really only become effective since the introduction of Lithium-Ion batteries. These charge quickly, and more importantly do not discharge for a very long time. That allows them to be powerful enough, to power a fast spinning motor, which is essential for a grass trimmer. Generally speaking the bigger the battery, the more power it will have. The most popular sizes are the 18 or 20 volt batteries, as these are compatible with some of the big branded power tools. So for example, the 18 volt battery used for a Makita drill, can also be sued in their trimmers. The two features that I have mentioned above are the most important. However, I also like to consider the cutting swathe. This is just a fancy term for how much grass gets cut at the base of the strimmer. The base will have a line that spins around in a circular motion. The width of that motion will determine how much grass area, can be cut when in that position. It is always worth checking on the balance of strimmer. Most of these will have a main handle that allows you to hold and direct the strimmer head. The motor is usually located around the centre. Then there is handle a a little lower down which allows you to find the balance of the strimmer.